Another Grand National has come and gone. You can read my thoughts on Saturdays big race. As well as a look ahead to another Grand National, the Scottish, which takes place at Ayr on Saturday. All this plus my Monday tip can be found inside…. When Red Rum won the last of his three Grand National’s back in 1976, just 9,000 people watched the race. On Saturday almost 70,000 were in attendance. Those figures show that the race remains in good health. So, it was probably right that Tiger Roll should win and become the first horse since Red Rum in 1974 to win the race in successive years. The 9-year-old doesn’t have the build of a chaser but he’s arguably the most natural horse over the national fences since Red Rum. The changes made to the National fences have done the race a great favour. Yes, it’s not the race it used to be but to the wider general public it remains the great spectacle it always has been. Too many “racing folk” seem to want to turn the clock back to the so called “good old days”. I can’t subscribe to that at all. Lest we forget the “good old days” of the Grand National involved drops on the landing sides so steep they broke many a horse’s leg and the ditches were so deep that fallen horses had to be hauled out of them. We still have a Grand National to enjoy and that's down to the race modifications introduced. It's possible without them it wouldn't still be with us today. Horse racing made the headlines for the right reasons on Saturday with Tiger Roll's win and rumours of the death of the Grand National look premature after Saturday. On Saturday it’s the latest renewal of Scotland’s most famous race The Coral Scottish Grand National. There is only one Grand National but the Scottish version of the race is up there with the Irish & Welsh races. Which horse will be adding its name to the alumni of winners this year? Big River – The bookies ante-post favourite. He ran an eye-catching race when staying on strongly to finish 4th of 24 in the Ultima Handicap at the Cheltenham Festival. The 9-year -old could well improve for the step up to 4m. His best form has come with plenty of juice in the ground so how he will cope with good ground is a bit of an unknown. Dingo Dollar, trained by Alan King, is next in the betting. The 7-year-old was runner-up in the valuable novices’ handicap chase at last years meeting and this race could well have been a target for the trainer. Crosshue Boy, beat Dingo Doller 12 months ago and there shouldn’t be much between the pair again. The 9-year-old has been subject to some good support for the race over the weekend. No issues with good ground for this one and if he stay’s the 4m, the Irish trained horse can go close. Give Me A Copper, trained by Paul Nicholls, returned from a 446-day break when 4th at Sandown, before falling in the Ultima was beaten at the time. He’s highly regarded by his trainer and remains capable of improvement over fences. A mark of 143 could underestimate him. Ibis Du Rheu, another possible runner for the Nicholls stable. A winner of a good ground Cheltenham novices’ chase on his seasonal reappearance back in November. Ran poorly at Warwick when last seen and was said to have bled from the nose after the race. That would be slight concern, but he looks an ideal type for this race. He's a real stayer whose at his best on good ground. Not one to dismiss lightly should he get his favoured underfoot conditions. Cloth Cap, trained by Jonjo O’Neill, made it 2 from 3, going over fences when winning at Catterick back in November. A 141-day absence to overcome but the 7-year-old remains open to more improvement over fences. He's well suited to good ground and a mark of 134 looks more than workable. Geronimo, would be a popular local winner. The 8-year-old made it 2 wins from 4 runs when winning a 3m 3f handicap chase here back in January. He remains capable of more improvement over fences and could well relish this 4m trip. Best form has so far come on rain softened ground. Verdict: A lot depends on the weather. On a sound surface both Dingo Dollar and Crosshue Boy would be strong contenders. On such going the likes of Ibis Du Rheu and Cloth Cap would also need respecting. Whilst a softer surface would bring the improving double course winner Geronimo into the reckoning. 4:20 – Gabrial The Saint, did well in the early part of last season winning at Chester and Leicester. He didn’t run to that form on his final three starts of last season. Has had a wind-op over the winter and looks on a competitive mark for his seasonal reappearance. The first big race of the new flat season the Lincoln Handicap was won in impressively by the Godolphin owned Auxerre. The 4-year-old had the potential to be the proverbial Group horse in handicap and so it proved. James Doyle deserves the plaudits for his ride on the winner. He had worked out there wasn’t a lot of pace in the race. He quickly got the front and once there was never headed, as he proved too classy for his rivals. Before the race I thought the David Elsworth trained Ripp Orf was in the grip of the handicapper. Now, I am not so sure. Held up as normal, the 5-year-old was tanking along in the hands of Hayley Turner. Making good headway two out he didn’t get the best of passages. Evan with a clearer passage he wouldn't have beaten the winner. Still it was good to see him finish his race off as strongly as he did to grab 5th. Given how well he performs at Ascot, on good to firm going, 2 wins from 3 runs 3 placed with form figures 131 and on good to firm going 3 wins from 7 runs 6 placed with form figures 1212314. The gelding is 5lb higher than for the last of those wins but on the evidence of his Lincoln run remains on a competitive mark. I can can see him going well in a big field Ascot handicap once again this season. Birkenhead, trained by Mick Channon, was the subject of some good reports before the Brockelsby Stakes. He looked fit enough before the race but when asked for his effort his inexperience was apparent and he was too green to do himself justice. However, the experience will not be lost on the colt. He’s no superstar juvenile in the making but looks more than capable of winning a race in the coming weeks. The form of this years first two-year-old race could be worth following. As both the winner Show Me Show Me and runner-up Strong Power look capable of better. 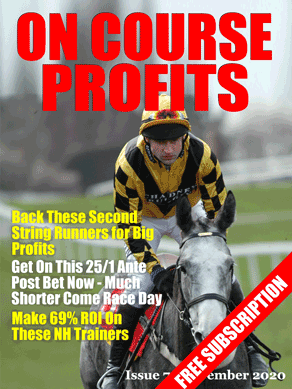 Here's my take on the National and a couple of other horses that look worth bets this week. These trends have found 10 of the last 11 winners or 91% of the winners from 24% of the total runners. My fancy is Joe Farrell. The 10-year-old ran well to finish runner-up at Newbury last time. I can see last years Scottish Grand National winner go well if his last race doesn't come too quick. Number 56 on the list of entries, he's by no means certain to get a run. However, if he does 50/1 looks too big to ignore. Shanahan’s Turn looks worth a bet in Friday's Topham Chase. The 11-year-old was second in last year’s race and can race off an 8lb lower mark this time around. Form this season has been poor, but he's likely been trained for the race and at 33/1, looks too big to ignore. Assuming he can get in the race. Duke Of Navan, trained by Nicky Richards, would have to be of interest if he was to take his place in Thursday's Red Rum Handicap Chase. Beaten just a head off this mark at Cheltenham back in October he was also an excellent 3rd at Leopardstown over Christmas on his last start. Despite his age he's on a winnable mark and 20/1 looks decent each-way value to me. Last weeks Monday tip Jacob Cats plugged on into third to land the each-way money. 2:50 – Marcilhac, trained by Venetia Williams, has pulled up on both his starts this season. However, it’s worth noting his top three Racing Post Ratings have come over C&D and the 10-year-old is on a winnable mark if boucing back to his best.